The fracas over identity theft by misuse of Social Security numbers has claimed another victim. 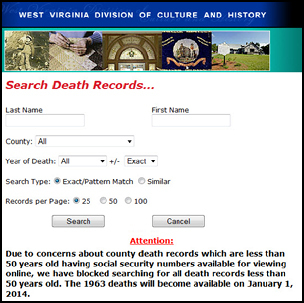 It used to be that all microfilmed death records in West Virginia, whether originating from state or county records, were available for searching online at the West Virginia Division of Culture and History website. State death certificates are on microfilm 50 years after the death, so records through 1962 are online today. Some counties, however, had death records that were just a little newer — not much, mind you, but just a few years. The most recent death records were those from 1971 — more than 40 years ago. Those most recent records are not online any more. West Virginia county death records, until recently made available from 1853 through the last year microfilmed in each county (ranging from 1967 to 1971) online, now are available only after reaching the fifty year mark, due to concerns about Social Security numbers appearing in these records online. Currently county and state death records through 1962 are accessible. 1963 county death records and state death certificates will be made publicly available online January 1, 2014. Subsequent years of birth and death records will go online each January. The idea that the simple presence of a 40-year-old social security number on the death record of an individual gone for more than 40 years is enough to warrant reducing public access to records by yanking them offline leaves The Legal Genealogist practically speechless. Just what exactly do we think we’re protecting ourselves from with this sort of reaction, and why isn’t it better for all to know that this particular Social-Security-number-and-name combination belongs to someone no longer with us? I think our elected and appointed officials forget who pays for these records to be collected and maintained, and we need to remind them often!! When a database exists for checking the recently deceased, numbers go down at the ballot box. 🙂 Yeah, there is that too. I’m sure all of the Identity Thieves are devastated and totally foiled by this (stupid) revision. NOT! This is such a shame and I hope it doesn’t set a precedent for other states now. I’ve always told my patrons to obtain as many documents on family as their budget allows because eventually HS will keep it from all of us. Sigh – Sometimes I hate it when I am right. I think this shows ignorance on the part of the officials. The year 1963 equates to deaths being tracked in the SSDI. But, does it equate to social security numbers being on the death records? Not in Massachusetts. Even if the numbers ARE on the records, these are 40-plus years old, for cryin’ out loud. It really shows the inadequacies of our government to monitor the Social Security Death Records and Index. With all the technologies that have been developed over the past few years why isn’t there a system that immediately red flags a Social Security number of a deceased person? I could see a problem with recent deaths but records of someone who died 40 years ago? I find it absurd. Policies such as these just shows how incompetent they are. This action reminds me of being back in grade school when the whole class was punished because one student didn’t behave themselves. I think you have it exactly right, Patricia. It’s easier to say “nobody can have the records” than it is to fix the control systems to prevent misuse. It boggles alot of minds! As pointed out, you’d think knowing that a SSN was associated with someone who is deceased would be a good thing. Apparently being able to say they’ve “done something” is more important than actually doing anything to deal with actual identity theft. Count me among the mind-boggled as well. Those death certificates are among the resources that I use the most in trying to figure out who’s who in my dad’s family. This is a sad loss of records indeed for my own family. I have a friend who used to shake his head and say “85% of people think they think.” Sigh. I’d say it’s higher than that and includes a very very high %age of politicians. Incredibly ridiculous. This is not good news. Thanks for the heads up on this. Thanks, Jana! It definitely isn’t good news, darn it. Sorry to “troll” but I need to know if someone can assist me with finding records of birth for a possibly half sibling of mine. My father is: Robert Maris Parten and from the website I can only find one record of marriage and attempted to track the bride but came up empty after their marriage. Is there a plan to continue to update the database with new marriage/divorce/birth records? Not inside the privacy window, Robert. For births, that window in West Virginia is 100 years and for deaths and marriage 50 years, so newer records will not be on the website. However, as a brother, you qualify as immediate family so you may have access to these records, and may want to be in touch with a good West Virginia researcher to see how to use that right of access when you don’t know the details of the birth. Use the Ask TLG button at the top of any page if you’d like to ask for some referrals.